This easy dish is great as a snack or an accompaniment to curry. A dollop of crème fraîche on top tempers the chilli. Peel two large potatoes (about 600g in total) and chop into chunks. Boil in lightly salted water for 5-6 minutes or until slightly undercooked. Drain. 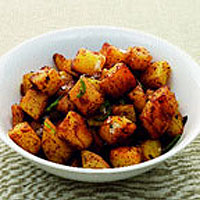 Add the potatoes and fry for 4-5 minutes or until they are lightly browned. Season to taste. This recipe was first published in October 2005.